About.com all "topic sites" are vulnerable to XSS (Cross-Site Scripting) and Iframe Injection (Cross Frame Scripting) attacks. This means all sub-domains of about.com are affected. Based on a self-written program, 94357 links were tested. Only 118 links do not belong to the topics (Metasites) links. 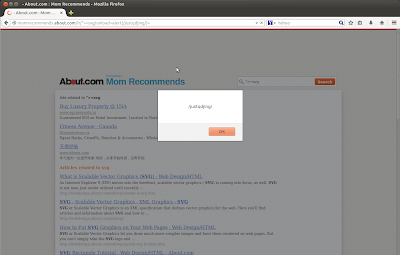 Meanwhile, some about.com main pages are vulnerable to XSS attack, too. This means no more than 0.125% links are not affected. 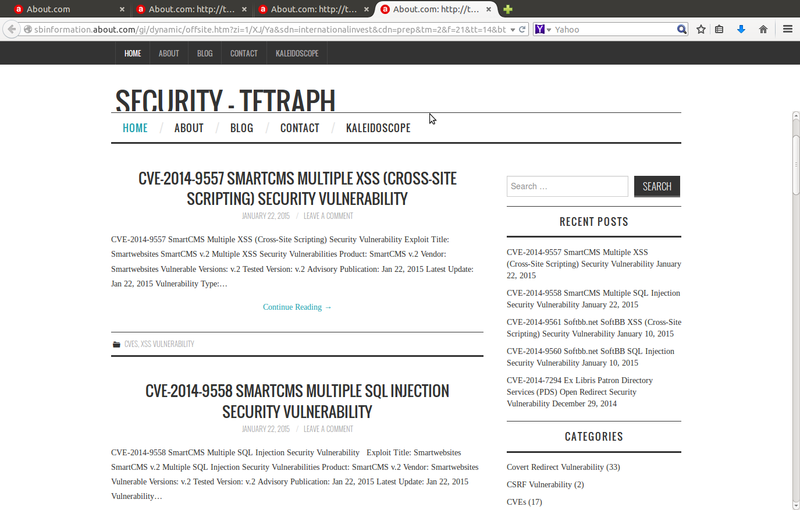 At least 99.875% links of About Group are vulnerable to XSS and Iframe Injection attacks. In fact, for about.com's structure, the main domain is something just like a cover. So, very few links belong to them. 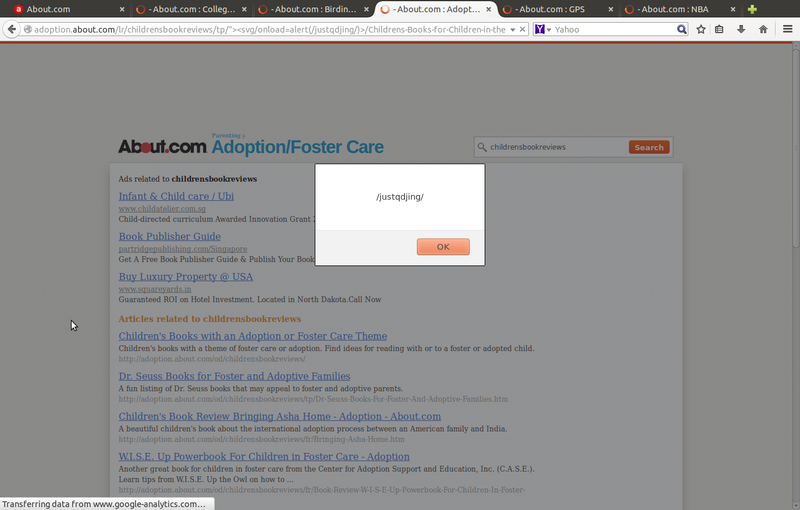 Simultaneously, the About.com main page's search field is vulnerable to XSS attacks, too. This means all domains related to about.com are vulnerable to XSS attacks. In the last, some "Open Redirect" vulnerabilities related to about.com are introduced. There may be large number of other Open Redirect Vulnerabilities not detected. Since About.com are trusted by some the other websites. Those vulnerabilities can be used to do "Covert Redirect" to these websites. XSS may allow a remote attacker to create a specially crafted request that would execute arbitrary script code in a user's browser session within the trust relationship between their browser and the server. Open redirect is listed in OWASP top 10. The general consensus of it is "avoiding such flaws is extremely important, as they are a favorite target of phishers trying to gain the user's trust." Several other similar products 0-day vulnerabilities have been found by some other bug hunter researchers before. CNN has patched some of them. "The Full Disclosure mailing list is a public forum for detailed discussion of vulnerabilities and exploitation techniques, as well as tools, papers, news, and events of interest to the community. FD differs from other security lists in its open nature and support for researchers' right to decide how to disclose their own discovered bugs. The full disclosure movement has been credited with forcing vendors to better secure their products and to publicly acknowledge and fix flaws rather than hide them. Vendor legal intimidation and censorship attempts are not tolerated here!" 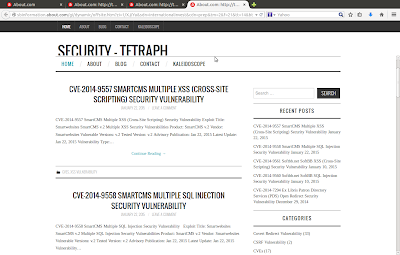 A great many of the following web securities have been published here, Injection, Broken Authentication and Session Management, Cross-Site Scripting (XSS), Insecure Direct Object References, Security Misconfiguration, Sensitive Data Exposure, Missing Function Level Access Control, Cross-Site Request Forgery (CSRF), Using Components with Known Vulnerabilities, Unvalidated Redirects and Forwards. It also publishes suggestions, advisories, solutions details related to XSS and URL Redirection vulnerabilities and cyber intelligence recommendations. Just attach "/lr/" to any About.com's sub-domains. Then attach "any codes + sciript" or attach "script" code directly is OK. 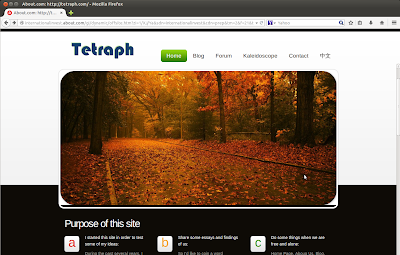 The structure is "http://subdomain.about.com/lr/*/script_code/*". The code programming flaw occurs at about.com main page's search field, e.g. 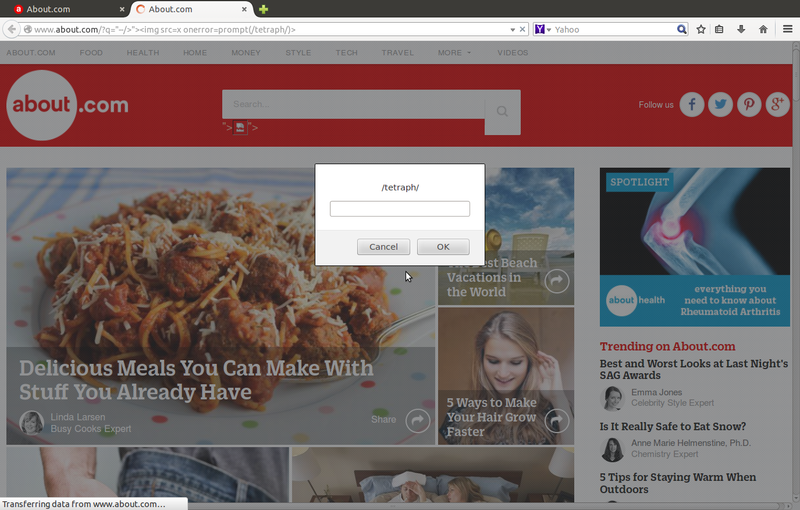 The vulnerability occurs at about.com "offsite.htm" page with "zu" parameter, e.g. About Group online web application has a computer cyber security bug problem. 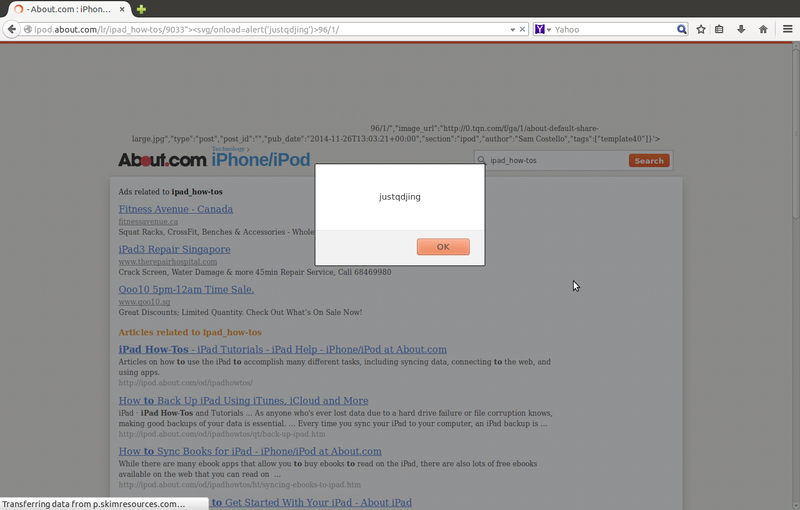 It can be exploited by Unvalidated Redirects and Forwards (URL Redirection) attacks. This could allow a user to create a specially crafted URL, that if clicked, would redirect a victim from the intended legitimate web site to an arbitrary web site of the attacker's choosing. 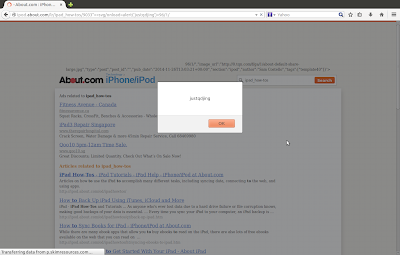 Such attacks are useful as the crafted URL initially appear to be a web page of a trusted site. This could be leveraged to direct an unsuspecting user to a web page containing attacks that target client side software such as a web browser or document rendering programs. Use one of webpages for the following tests. The webpage address is "http://www.inzeed.com/kaleidoscope/". Suppose that this webpage is malicious.